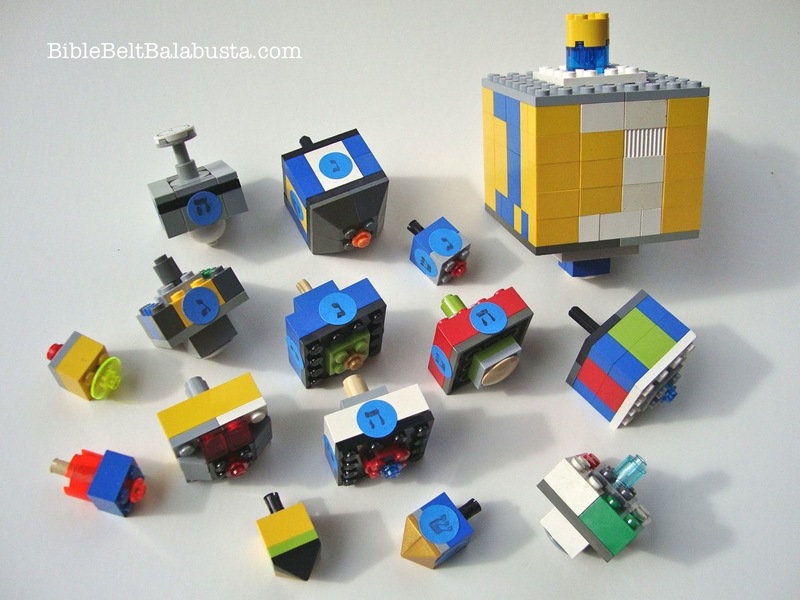 I am in search of the perfect LEGO dreidel. In this case, perfection means cheap, easy and fun. The model will need to attract Chanukah carnival go-ers between the ages of four and eleven, each of whom will be offered a chance to make and take said ideal dreidel. Thus, above all, it’s going to have to spin. Really spin. My search might benefit you, too: you, the grownup with a LEGO lover at home or in the classroom. 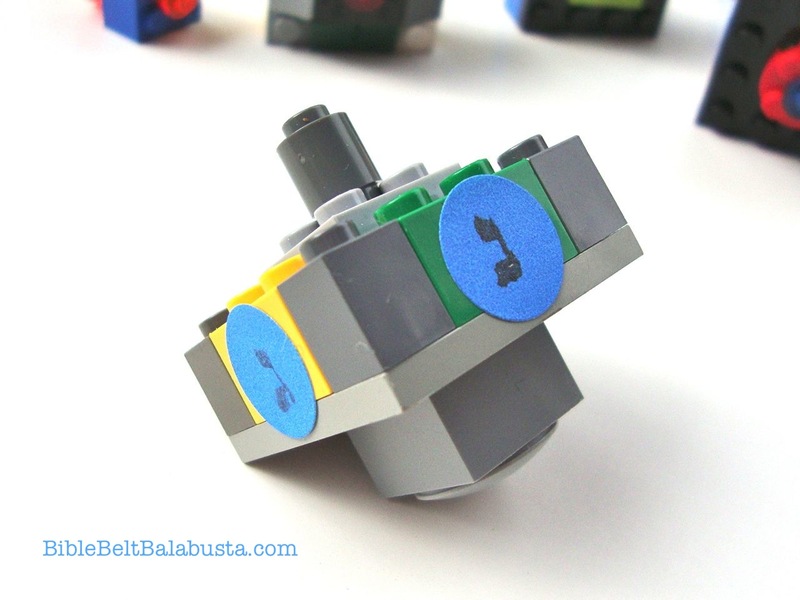 The act of building a LEGO dreidel is chock full o’ educational benefits. So many elements to consider: you’ve got to have four balanced sides; a low center of gravity; a minimum of friction; a smooth, wide contact point and a design that doesn’t fling itself to bits when it bashes into another dreidel. Figuring all this out with your kid is more than half the fun. Building a dreidel builds other stuff, too, like enthusiasm for the holiday and a deeper appreciation of those four important letters and what they stand for. 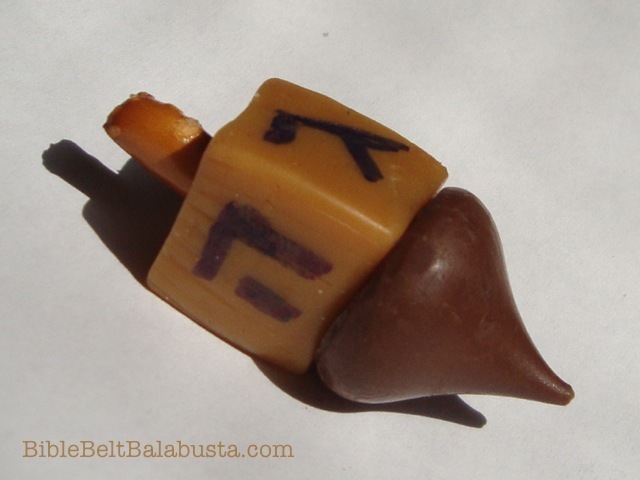 The letters on a homemade dreidel need to be arranged in the correct order going right to left. Nun, gimmel, hey, shin are the abbreviation (an initialism, actually, if you want to get all nerdy) of nes gadol haya sham: “a great miracle happened there.” So, a shin will never be adjacent to a gimmel, for example. 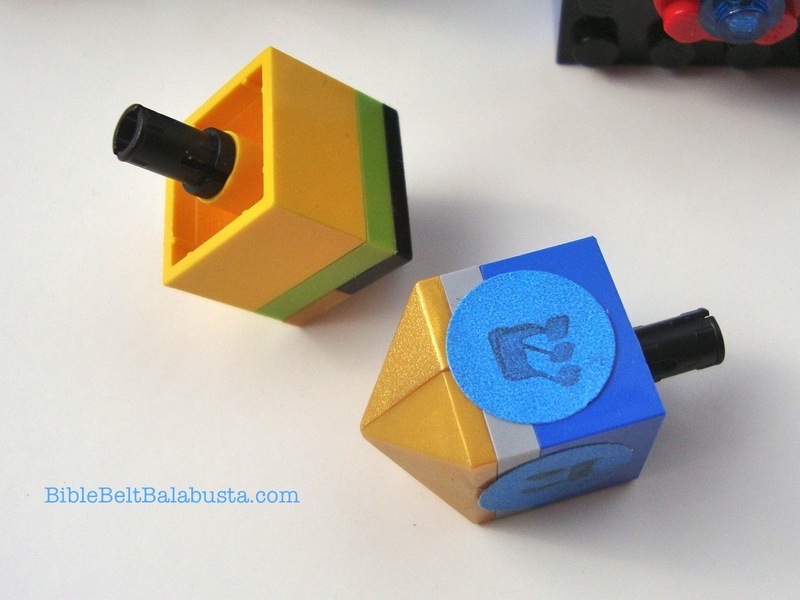 See last year’s dreidel post for tips about adding letters to LEGO dreidels with tape, stickers, markers and such. 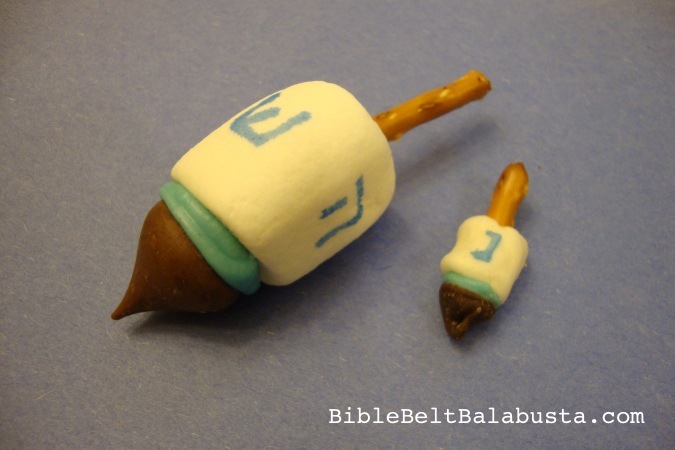 I started my search with a peek at all the online LEGO dreidel examples I could find, which were surprisingly few. Most are in family Flickr albums or kid-created YouTube videos, but a few actually had pdf instructions or made it to a post at GodBricks. All are worthy, all are fun, some are lovely, but—according to my re-creations of each model—hardly any of them actually spin. I mean, spin like a traditional dreidel whose dimensions have been honed via centuries of multi-national-trans-ethnic-collective-consciousness-know-how. Not that there is anything wrong with less than stellar spin. My own LEGO dreidels from last year’s post didn’t spin terribly well, but our goals were not limited to spin, spin, spin. We were in it for the exploration, the trial and error, the being together. But, as I say, for this current project, in which I will need to please dozens of kids, spin is crucial. My Kindergartner and I have already spent many an hour on this search, yet we still don’t have a clear winner. Still, here are two models in the running for the Carnival kits. 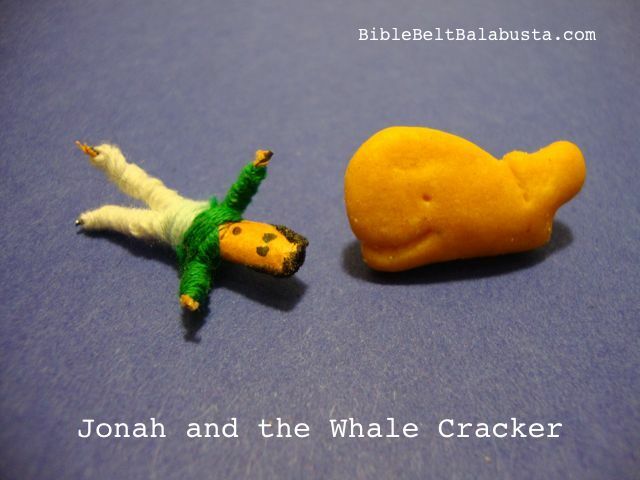 I hope they inspire you to created different ones, better ones, and to share them with us via the Bible Belt Balabusta facebook Page. Model A: Cute and simple. For older spinners. Model A looks like a “real” dreidel—about the size of the small wooden and plastic ones many of us Hanukkah Parents buy in bulk and bring to our children’s secular classrooms—but it doesn’t spin quite as easily. 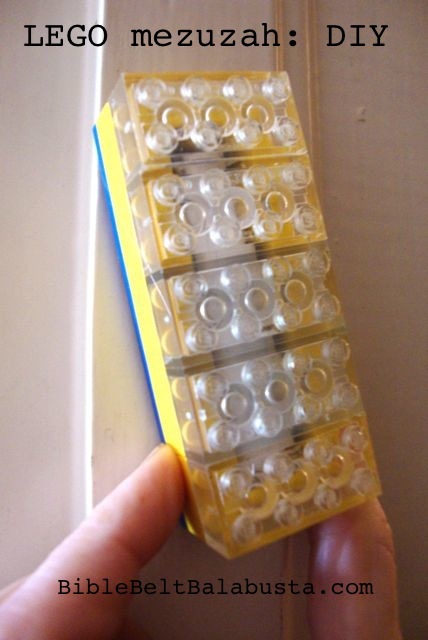 The Technic friction pin handle (half of which is inside the tube of an upside-down 2×2 brick) seems to distribute the weight pretty well, but the sharp contact point formed by the (beautiful) golden roof slopes mean that it takes mature fine-motor skills to work it. Model B isn’t as cute, but it has a satisfying heft and is easier to set in motion. Because of the wide, square body, it is given to travel, so it will probably fly right off a table. It spins on a rounded 2×2 plate called a “boat stud” (an alternate contact point can be a 1×1 round plate). The top 2×2 plate right under the 1x cylinder handle can be round or square. The bottom 4×4 is crucial to add weight and stability down low. This model is good for knocking the crap out of your opponent’s dreidel: those corners are wicked. My Carnival station will have small boxes of parts: one box per part, with a label to indicate how many of each part is required (“take one,” “take two,” etc.). I’ll provide finished models as a visual guide, plus a photo of the components in exploded view. Kids will select what they need and then build on a tray with raised sides. The sides keep components from slipping off the table, and act as a small arena for test drives. To finish the dreidel, the kids will rubber stamp the Hebrew letters onto 1/2″ Avery round labels and apply in correct order. Do share any models you and your kids come up with. If I get responses, I’ll stick ’em in a post. The world clearly needs more LEGO dreidels, especially if they are made by children and spin like mad. 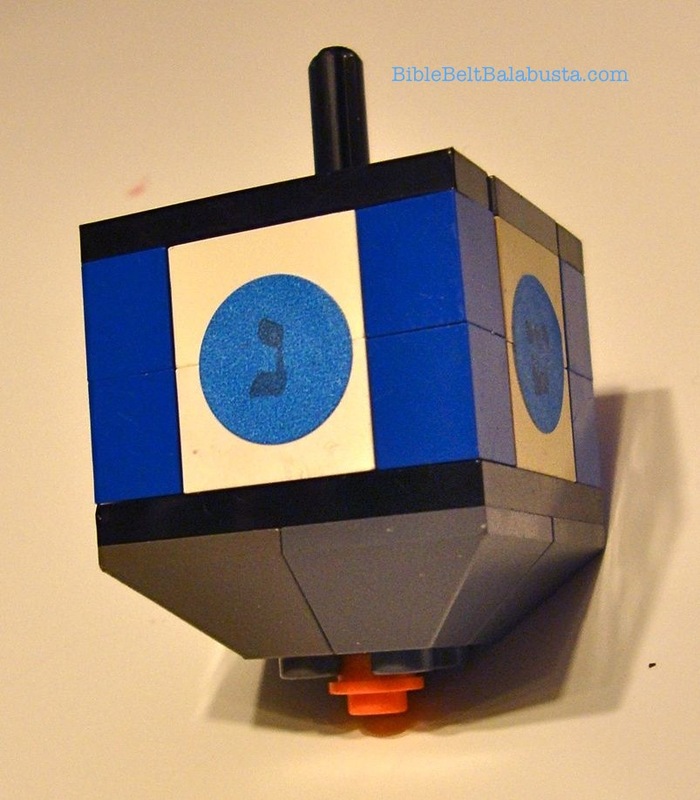 This entry was posted in Activity, Hanukkah and tagged chanukah, dreidel, Lego. Bookmark the permalink. Hello. In model A do you know the name of the bottom two pieces (the “triangle ones”). 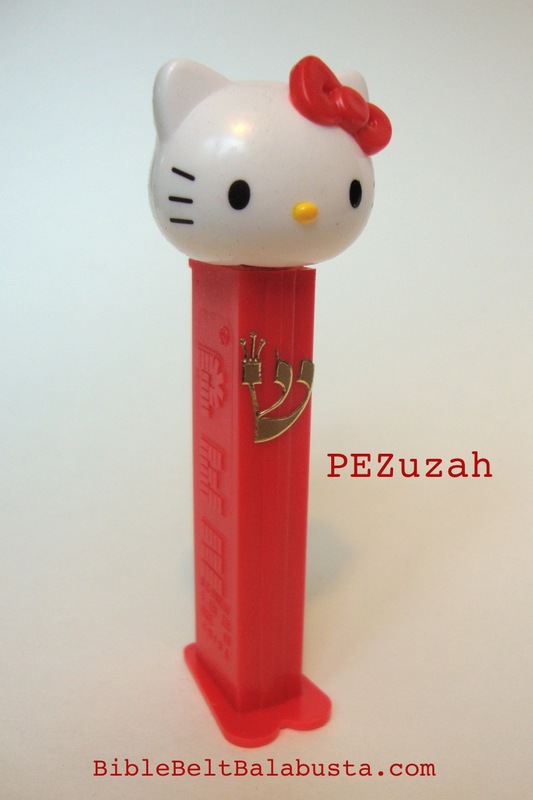 I found one in our box of legos, but I was hoping to get the name so I could hopefully order some. Check out bricklink.com. It’s an AFOL (adult fan of LEGO) site where individuals set up shops to sell to others. You can find almost any piece ever made. Thanks for adding bricklink.com, Bruce. Just this month, I realized that some Bricklink shops don’t even require a minimum amount for purchase, and some sell used parts, too. For the small dreidel, which is VERY much like the ones I remember playing with as a child, instead of using the slopes for the point, try using a 2×2 tile with one stud in the center. Then put a 1×1 round plate onto the stud. That will give you a larger point to spin on. Thanks, Suzy. Yes, what you suggest is one of the easiest to build and spin. 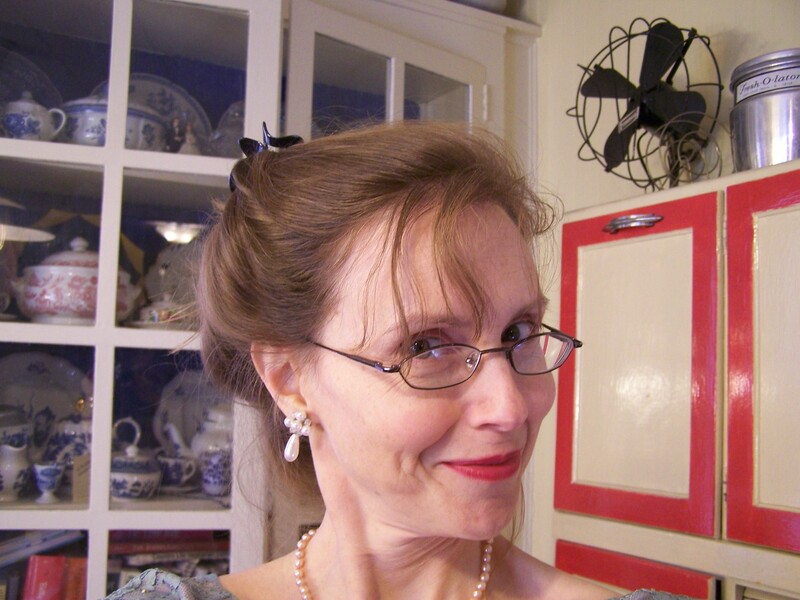 Several of the examples in this this post’s pic have the pip (a.k.a. stud and 1×1 round plate) as contact point. My pointy version (with the slopes) was meant to mimic the look of a traditional dreidel, even at the expense of spin.